AS I WRITE we are still bogged down in Lent but it will not be long before we follow in the Way of the Cross. So good that all our three churches are to spend the Triduum together. I admit that at first hearing I had a tinge of regret that we were not able to keep the festivals in our own beloved church. And then the flood of realisation that we all need to be open to the thrill of Easter (‘the shock of the new!’). The reason so many Easters have passed us by is that we have insulated ourselves against the secret message of the Risen Christ. Like so many church-goers we know that if we take the Festivals too seriously, we may have to change, forgetting that it is those very festivals that bring us the new life and hope that alone can save us from ourselves and incipient despair. I have got a pile of old and useless stuff in the shed waiting to be taken to the tip. It is nothing to the black bags full of past stupidities and shortcomings (I avoid the word ‘sin’!). I never quite know what to do with it all. I try pretending it is not there or does not matter, but I keep falling over it. There is a lot of self-centredness and thoughtlessness, several bags of unkindness, both words and deeds, lots of waste, laziness, failure to be generous and act as a responsible citizen or to respect the planet and as for loving my neighbour! There are a few things I would rather you did not know about but most of the stuff is all too obvious and everyone sees our failure to be any sort of genuine human being. The only place I have ever found where all this dangerous rubbish (and it is all beginning to smell a bit) can be safely dumped is at the foot of the Cross. What does the old hymn say? ‘At the feet I lay them and I LEAVE them there.’ It is called forgiveness, one of those Christian words that are often talked about but seldom taken up. But why else did He die on the Cross? Without Easter I would never have realised that the Cross was not a defeat but a victory. If Easter had not happened, Good Friday would still be Christ’s conquest over sin, but we would not have known about it. Easter is God’s secret, full of surprises. Read in the Gospels how the disciples were always caught out by the Risen Christ. He turns up as gardener, traveller, cook. This Easter watch out for him in unexpected people and places. It is the eye of the imagination that reveals the Risen Life. In the Diocesan insert included in the paper version of this magazine, Bishop Michael writes about his vision for a much ‘higher profile’ Easter this year. If you have not already taken one, please take a car sticker and put it in your car and also help yourself to the A4 posters that are available for prominent display! Bishop Michael also had the idea of every parish putting up a cross on Palm Sunday in a place where it would be noticed. All Saints’ will carry their cross as part of the Palm Sunday procession from the Cotswold Grange Hotel in Pittville Circus Road. It will then be put up in front of the church. St Nicolas’ is making use of their huge window space and will display a cross on a banner worked on by the Sunday Club. St Mary’s will join with the United Reformed Church, who are having a cross made and painted white. On Palm Sunday (1st April) everyone is invited to meet at the United Reformed Chapel in Deep Street at 10.30am for a very short joint act of worship as the cross is put in place. Bishop Michael’s idea is then for two things to happen to the cross during Holy Week: for a crown of thorns to be added on Good Friday and for flowers to be added on Easter Sunday, proclaiming the joy of Our Lord’s resurrection. 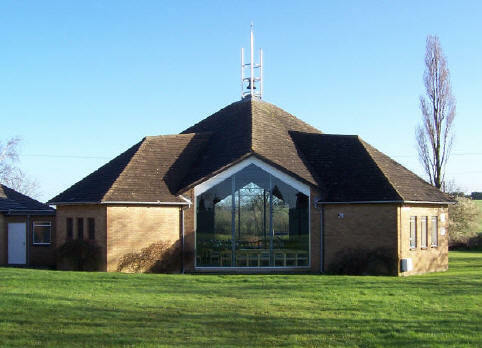 Again, everyone is invited to the United Reformed Church at 11.45am on Good Friday for a short joint act of worship as the crown of thorns is added. On Easter Sunday, those who can are invited to attend at 10.30am when the cross will be decorated with flowers. Lent is a very good time to make use of the Sacrament of Reconciliation (confession). It is a way in which we can prepare personally for the Easter celebrations, spending some time prayerfully examining our lives and then bringing to God those things which especially come between Him and us. Hearing the words of God’s forgiveness spoken personally to us can be a wonderful experience. Alternatively you can make an appointment with one of the clergy. Please do speak to them if you would like to talk about how to make your confession. Our theme about Moses at Celebrate! finished with a fascinating and illuminating service where we learned about Passover. We were able to understand, through re-enactment, the significance of the festival, particularly the family meal of celebration. Firstly we washed our hands, with most of the children preferring to do this in the font! Then we tried matzo crackers with herbs and a sweet honey mixture which represented the unleavened bread which the Israelites had to make in a hurry for their journey. Finally we all tried some grape juice which was a real hit with the younger audience. The story of Moses has so many vivid and enthralling features: the baby in the basket, the burning bush, the deadly plagues, the flight from Egypt and finally the parting of the sea. All of these were brought to life through a mixture of video, song and action at Celebrate! during these past few weeks. WE RECENTLY HELD a Finance meeting and discussed the Architect’s recommendations following the Quinquennial Inspection. The total cost for the work needing to be done at St Mary’s amounts to approximately £17,000. This is, of course, on top of our normal running costs, which we sometimes struggle to pay. It is a huge amount to find from our limited income, but the longer we leave the work outstanding, the more costs will be incurred. So we have to go ahead in faith that this money will be forthcoming. If you feel that you can support this important task, please speak with Father Michael, who will be delighted for any donations towards keeping St Mary’s in good condition for our future generations. Very many thanks to Jackie Moles and all her helpers in the car park and to Gillian Jackson and her helpers in the kitchen during Gold Cup Week. This year they raised £2513.77 from the car parking and £177 from the sale of refreshments, giving a grand total of £2690.77 for church funds! Thank you all very much for all your hard work. I wonder if you were surprised to see the Book of Jonah included in the readings for the Bishop of Gloucester’s Praying Together in Lent. It is not high on our preferred choice of lessons, this rather strange fable of a singularly unattractive figure, cowardly in his flight from God, sulky and obstinate when what happened wasn’t to his liking. We fail to look further than our childhood picture of Jonah being swallowed by a whale and sitting under a castor oil tree. The same kind of fear came upon the disciples of Jesus after he had stilled the storm or the centurion who witnessed the death of Jesus. Those who truly encounter the living Lord tend to be overwhelmed and the only response is worship and a dedicated life. Later in the book Jonah obeys God and tells the people of Nineveh that their great city is doomed and will be destroyed (with, probably, a certain amount of righteous satisfaction!) but cannot, then, accept God’s recognition of Nineveh’s repentance. He refuses to believe that God’s freedom and compassion can extend to a great pagan city like Nineveh even when that city has shown repentance. He would avoid even giving them a chance. And there is perhaps a lesson here for all of us. It is all too easy to give up on individuals or classes of people and assume that they will not accept the gospel or, if so, it will only be temporary. The Book of Jonah is a magnificent lesson in the love of God for all men. It calls on the Jews to abandon their exclusiveness, to bring God’s word to the Gentiles and to rejoice when they accept the message. William Barclay calls it ‘the one supremely missionary book in the Old Testament’. But Jonah also makes it clear that repentance and a turning aside from sin are necessary responses to forgiveness. ‘He does not want the death of a sinner but rather that he should repent and live’ (Ezekiel 33:11) and for Jesus Jonah is a sign of the call for conversion (Luke 11:29-32 and Matthew 16:4). A reading of the Book of Jonah is appropriate as we approach Eastertide, not only in its emphasis on the universality of God’s love, but also in the extent to which Jesus compares his own death and resurrection with Jonah’s time in the belly of the great fish (Matthew 12:40). Read the story of Jonah with the Gospels in mind and allow new insights to emerge. On Palm Sunday afternoon (1st April) from 2pm St Mary’s will host various activities to help promote the Easter theme. Refreshments will be served in the church and there will be the opportunity to try out the Prayer Maze which is being prepared for our Infant and Junior schools. The afternoon will also include some informal worship. Do come along and why not bring a friend or neighbour? The house-to-house collection week runs from 13 to 19 May and this year Christian Aid celebrates fifty years of ‘making a difference’ to poor and needy communities all over the world. We are reminded to help them ‘grow’, also to ‘grow’ more collectors, so that we can make a greater impact! We are always in need of collectors, Prestbury having quite a large parish to cover, and this year some of our faithful helpers may wish to do a bit less. So that each of us is not over-burdened please could you consider joining us to collect from a road or street? If anyone could take on organizing collectors for a list of ten small areas it would help enormously! Following on from the successful Education and Nurture Event on Epiphany Sunday, Father Paul will present Garden of Delights on Sunday 15 April in St Nicolas’ Church at 4.30pm followed by Easter Tea and concluding with Carols for Easter at 6.00pm. At our AGM in February Marion Beagley was re-elected as Leader and Julie Jefferies as Treasurer. During the Eucharist following, celebrated by Father Michael, a former member was readmitted and all members renewed our MU vows. The MU Wave of Prayer is on Sunday 15 April. Prestbury’s slot is 10-11am and will be held in the Upper Room at St Mary’s. Please enter via the kitchen as Celebrate! will be in progress in the church. Our April meeting will be held on Tuesday 24 April at St Mary’s Church at 7.30pm. Canon Pat Harris’s subject will be On a Wing and a Prayer. All are welcome to join us. This month’s bakestall at St Mary’s is on Sunday 15 April with contributions from those with surnames G-M. Do contact one of us if you would like to join the rota. The next Parish lunch will be at the Royal Oak on Sunday 20 May at 1.00pm. Please give names to Marion Beagley at St Mary’s or Sue Bolton at St Nicolas’. A two-course lunch will cost £11.00 per head and the choice will be Roast Pork, Roast Lamb, Roast Turkey or Vegetarian option. Please join us for this time of fellowship with other church members.